As your kid has a blast filling this page with colour, she'll also practise learning the letter P.
What scares mice and makes a "meow" sound? Let your child figure it out by reading these cute little riddles for kids. Ever wanted to learn a new language? Try this fun Russian alphabet page, complete with Russian sight words, coloring, and the pronunciation of each word. Check if your students can use drawings to depict key moments in a story! "I'm stuck in the riddle with you!" These fun riddles for kids not only help your child's reading skills, but he can finish off with a delightful drawing. Does your little one love cereal? 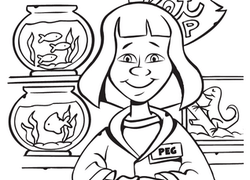 Then she'll enjoy this fun coloring page, featuring a classic cereal choice: Corn Flakes! What's for dinner tonight? Encourage your little one to learn her food-related sight words with this coloring page, featuring a delicious ham and chicken! Looking for a fun language arts enrichment activity? Try this Russian alphabet sheet, where you'll learn a letter of the alphabet in another language!